Seattle Dominates Denver To Win Its First Super Bowl : The Two-Way The Seahawks scored within the first 12 seconds of Super Bowl XLVIII against the Broncos and never slowed down, handily taking home the Lombardi Trophy with a final score of 43-8. 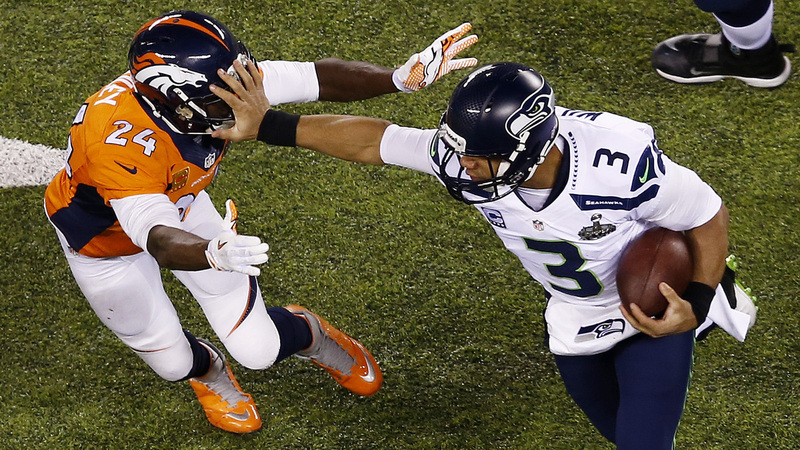 Seahawks quarterback Russell Wilson stiff-arms Broncos cornerback Champ Bailey on Sunday during Super Bowl XLVIII at MetLife Stadium in East Rutherford, N.J. The Seattle Seahawks defeated the Denver Broncos 43-8 to win Super Bowl XLVIII at MetLife Stadium in East Rutherford, N.J. on Sunday night, the first Super Bowl victory in the team's history. The game got off to an odd start on the first play from scrimmage when Broncos center Manny Ramirez snapped the ball past quarterback Peyton Manning, who was walking up to the line and didn't have his hands ready. That set the tone for the trouncing the Broncos would receive over the course of the night at the hands of the voracious Seahawks. The safety scored by Seattle on Denver's bungled snap gave them a two-point lead after only 12 seconds, the fastest score in Super Bowl history. Seattle kept that momentum going with a 31-yard field goal on the following possession, putting the score at 5-0. After a failed Denver drive, Seattle's Steven Hauschka kicked another field goal following a dramatic 13-play drive led by quarterback Russell Wilson, marking a score of 8-0 for Seattle with 2:16 left in the first quarter. After two interceptions thrown by Manning, the Seahawks ended the first half of the game with an impressive 22-0 lead over Denver. It was not looking good. The rousing halftime show by Bruno Mars, who was later joined on stage by the Red Hot Chili Peppers, included the singer's appropriately titled hit "Runaway Baby," which probably did not help de-salt the wounds the Broncos were suffering. The second half of the game didn't start much better for Denver, as Seattle receiver Percy Harvin answered the opening kickoff with an 87-yard touchdown return, further increasing the Seahawks' monster lead to 29-0 with plenty of game left to play. For those keeping track, this means Seattle scored 12 seconds into the first half and 12 seconds into the second half. The rest of the game never turned around for Denver, despite a touchdown and 2-point conversion late in the 3rd quarter. Seattle continued its rocket-like trajectory toward the team's first Super Bowl win, scoring again in the final quarter of the game to bring the Lombardi Trophy home to the Emerald City. Also, in case you missed it, legendary quarterback Joe Namath's amazing fur coat stole the show during the coin toss. Perhaps it was that impressive coat that caused him to botch the first toss, flipping the coin too soon. As with all things, it quickly spawned its own Twitter account.